So, None But My Own...My thoughts, my ideas, my tastes, my archives, my friends... When I started this blog, part of the attraction was to start fresh. I wanted this to streamline all of what I had accomplished with Midwest Metal, trim the fat (business and excess) and be left with what truly moves me. Well, a huge part of MM was my initial co-Editor, the Mercyful Fate/Diamondbanger specialist Kain. So his tastes are about as night and day different than mine, but his passion for what moves him cannot be denied. He recently conducted this in-depth email interview with Austria's Edenbridge and I'm glad to include Kain and his influence on NBMO. Congratulations on finalizing your 7th studio album, entitled 'Solitaire', which is due to be released in July 2010. How long was Edenbridge in the studio? Thank you. The recordings for ‘Solitaire’ took three months. For us it’s more relaxing since we’ve been recording in Lanvall’s Farpoint Station Studio. So we are more free to use the perfect moment – magic moments. Can you explain a little about the process Edenbridge uses? Are the songs and lyrics basically finished before entering the studio or does everything come together after you enter the studio? Lanvall is doing pre-production. During this time he beholds himself more as a composer than as a guitarist he is on stage. This means, that he is putting the focus on the songs and not on single instruments. Sometimes I tell him some basic wishes how I like to use my voice, but generally he knows that very well. This pre-production doesn’t mean that everything is un-removable. Sometimes we change also things during the recording process, but mostly the songs are completely perfect. 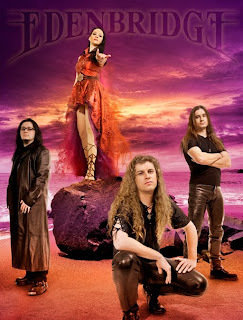 There has been some band turn over in recent years, with only you and Lanvall remaining as original members. How comfortable has the writing/recording process been with the new members? Every change of band members includes risks but also a chance for new energy. Of course every band member influences the progress of a band and their songs also if they are not directly write songs. Looking at the tracklist for Solitaire, one song immediately got my attention, “Brothers On Diamir”. Is this song about the mountain climbing brothers Reinhold and Günther Messner? Yes it is. Lanvall is a big mountain fan. We both like skiing and hiking in the mountains – we have a lot of them in Austria. But he would also love to live in a town very high up, while I more prefer the smaller hills for my life. Lanvall has been admiring Reinhold Messner since he’s been a little child. Messner lives his passion in the mountains, like Lanvall in music. The story of Reinhold Messners brother Günter, who died on his trip on Nanga Parbat, is very emotional of course and shows us how near beauty and pain can be together. Do you use the Czech orchestra on Solitaire? Are there any surprises on this album? 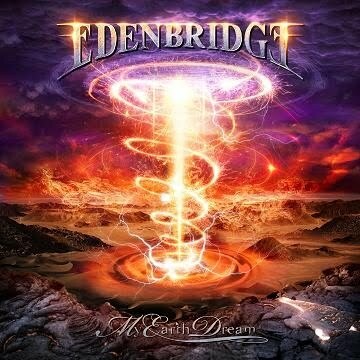 I mean, does Edenbridge venture into uncharted musical territory or is it a “play it safe” type of release? Working with a real orchestra, what we used for our last album 'MyEarthDream' was a big experience and made Lanvall grew as a composer for classical and symphonic orchestras. He’s been studying the symphonies of Anton Bruckner (his classical favorite) for years, and so he learned how to use every instrument in an orchestra. 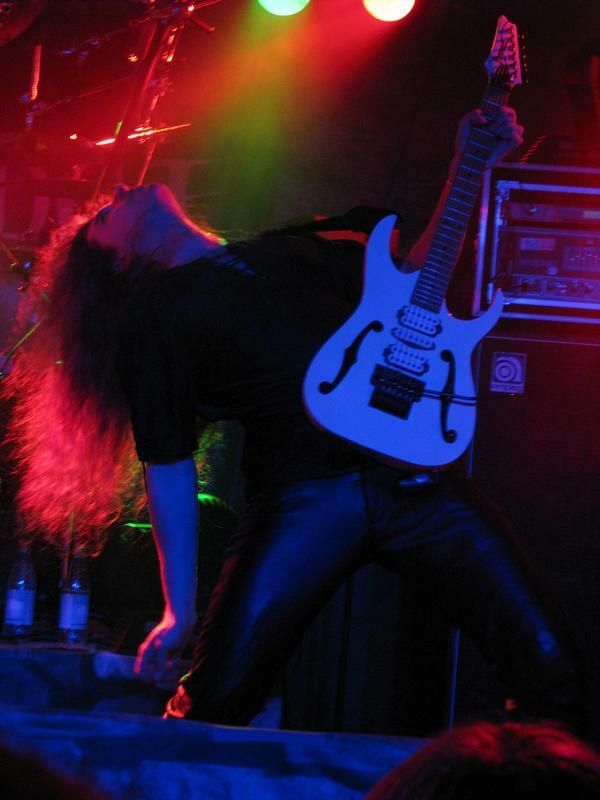 Not very many musicians in the metal scene can do this on their own. Normally they need a classical composer for this important part of the music. With 'Solitaire' due in July, will Edenbridge be playing the European Festivals in the summer of 2010? At the moment there is nothing planned concerning the festivals, unfortunately. Maybe a tour of North America in 2010? Definitely, there is a plan for a North America tour in November, what make us very happy. At the moment we are checking out the possibilities. Between 2002 and 2004 you lent your voice to several side projects. How did those projects work out? How come you haven’t had any projects in 6 years? Do you think you will be involved in any in the future? At the moment I work on a project for an Italian project called Raven Black. It’s a very kind song called “Lullaby for a Wolf”. Many people write me, that they like the warmness in my voice. Of course it’s a big tribute for me to get so many offers for projects and it’s always an interesting challenge for myself, singing songs from different composers. It’s also always a step forward for me to develop my voice. Have you been a singer since childhood? Do you have a non-metal vocal background or has it always been about singing metal? You are right; since I was a little child music was a direct access to my inner self more than anything else. I recognized soon that music is bringing me to myself, to my emotions as to my inner force what I would define as soul today. Especially my mother has supported my way unconsciously with her sensitive being. She loved to sing with me without restraint and without having the aim to reach something. We spent whole afternoons like this and had a lot of fun. The fact that I didn’t grow up with her, this common ground bound us together and this will last for a lifetime. Besides I have been working on training my voice since I’ve been a little child. I have put a lot of effort that my voice sounds clear and I have experimented with that endlessly and on my expression. And I have also recorded everything with a simple cassette recorder and listened to it with critical ears. That was a lot of fun. My wish was to become a professional singer from now on although I never made up my mind about stardom or fame or anything else. I also never had anybody as an example; I always listened to my inner voice when singing. I sang in choirs when I was a child. Later I took lessons at a very good teacher, who sent me on my inner way with her breathing and body exercises. This way I still follow. The biggest challenge for me was to follow the inner desire to express my feelings in front of an audience. Because on the one hand I wished for nothing more than to touch other people with my voice, on the other hand it was my biggest fear to be on stage and attract all the audiences eyes. My stage experience before Edenbridge was just a girlie pub band where I was guitarist first and then singer, so I was not on the front. With Edenbridge I jumped into the cold water in the year 2000, cause we changed from a project to a band with our first CD 'Sunrise In Eden' and immediately went on European tour. That was heavy for me. But I soon recognized how Lanvall´s music that suits me down to the ground, is carrying me and how the power of the boys in the band are layering down the ground, where I can venture outside. I face this as a life time developing process. Are you a fan of any other metal bands fronted/co-fronted by women? I like many bands which are fronted by women, but I’m not that fan who knows everything about a band or their band members. I think it would be great if also more bass or guitar players or even maybe drummers are women – why not? I love the band Heart for their performance and of course the voice of Ann Wilson is phenomenal. 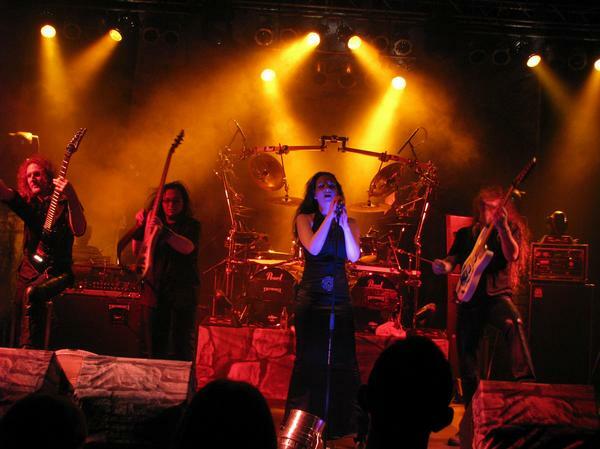 Edenbridge is one of the few bands that don’t use the Beauty and Beast approach to symphonic metal. I think that is one of the things that make Edenbridge really stand out from the crowded pack, choosing only the beauty vocals. 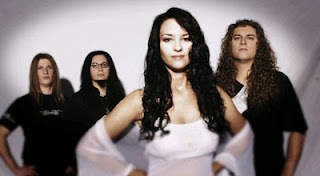 When we recorded our first album we’ve been together for a project for years and at that time it was really something new that there is a female fronted singer in a metal band. 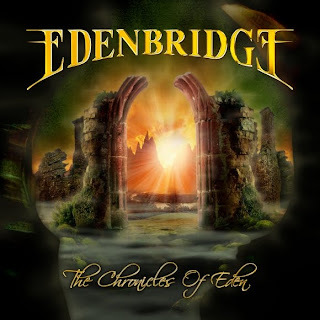 Edenbridge stands for bringing heaven on earth and this means for me to realize that we have both sides in us – the heaven and the earth – the beauty and the beast. This awareness brings us together with our real inner force. I see this as a lifelong learning and I adapted it as my way of vocal training. By the way we have choirs sung by the great male singers Robby Valentine and Dennis Ward (PinkCream 69) which also make our sound unique. A lot of male fronted bands add a female voice here and there for effect. Moonspell and Cradle of Filth come to mind. 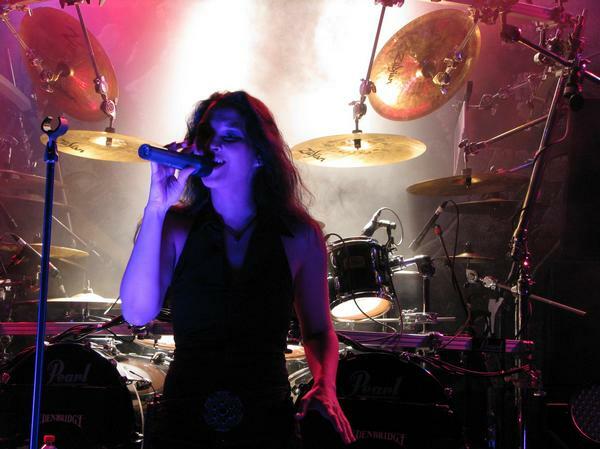 Edenbridge employed clean vocals by D.C. Cooper on “Red Ball In Blue Sky” off Aphelion. Since then, have you ever been tempted to add a male voice for the occasional verse or line? Lanvall and myself are big fans of D.C. Cooper and it was great working together with him. We had plans to ask Mike Baker of Shadow Gallery one time for a duet. It made me very cheerless when I heard that he died; much too early with only 45 years. Months later, a fan of us, who knew Mike personally, told me, that he spoke with Mike at a party and he was very delighted by my voice and Edenbridge and that he would have liked to sing with me. I never had the chance to get him known personally. Going back to your cover of “For Your Eyes Only”, how did you select that song? Are you a fan of James Bond or just the song? Solitaire is the character played by Jane Seymour in the James Bond movie: “Live and Let Die”. Is this just a coincidence or a theme? Lanvall likes the James Bond movies especially the older ones with Roger Moore and he had the idea for “For your eyes only”. I sang it a bit higher than Sheena Easton and of course we made a metal version. For us, a cover version only makes sense, if you can hear the difference to the original. Solitaire in our case means the uniqueness of everybody on this world and remind us to our diamond connection which is indestructibly for better or worse. In your free time, you enjoy photography and painting. Can you explain a little about these passions? I like being creative in many directions and I have got a fable for pretty things. These things do not need to be expensive, so for example I like visiting flea markets. In matters of colors I’m definitely not typical for metal, because I love all the colors also for my canvas painting. At home I need a warm and nestle atmosphere and I like to reach that with colors, lights and good food. I like cooking. What is the last good book your read? I like reading books with themes of psychology and spirituality. All the books from Hal and Sidra Stone are amazing books for me. The other one which I lately read is called Feldenkrais for singers. Are you a fan of the winter Olympics and cheering for Austria? Do you have any favorite sports? Sometimes I’ve got the idea I’m the only one in Austria who isn’t interested in passive sports. I’m not able to share those enthusiastic for somebody I only know from TV. I think it’s very positive if people are connected in freedom from all over the world to this event, but it seems that in this kind I’m not very patriotic. For myself I like skiing, cross-country skiing, swimming, hiking and my body works, but I don’t like doing one of that to match with someone. Any final words to your fans in America? To all our fans thank you for your great support. We will do our best for coming to America with our next album and we hope to see many of you at our concerts. Have a look to our website and please sign up for a newsletter! Thank you so much for your time. I know your fans are waiting very patiently for 'Solitaire'. Hope to see you soon on tour in America! Thanks again Sabine. Thank you very much for your great questions. I hope to meet you onetime on tour in America. Hopefully soon!